Of particular interest among fans of entertainment on the water is one of the recognized leaders - Polaris. Jet ski of this brand, first of all, you should pay attention to the MSX 150. It seems that the developers have put all their knowledge and skills into this model. The modern 4-stroke turbocharged engine with a power of 150 horsepower is considered one of the most quiet and environmentally friendly. But this is the technical side of things. And now - emotions, because without them, when it comes to jet skis, can not do. Imagine a personal small boat, fully compliant to the master’s hand and reacting to his whims, one might say, with pleasure. At least when communicating with the MSX 150, there is a feeling that he has a soul, and for the driver this soulmate. And her "body shell" is quite harmonious - the designers did not work in vain. Jet ski is a rather risky vehicle: high speeds, unpredictable water elements, etc. The MSX 150 (as well as the entire MSX series of the three basic models 150, 140 and 110) has an increased level of security, primarily due to its high stability, excellent ergonomics and a well-thought-out warning system about the life of the engine. The same applies to other models in this series: the 140th (with a 140-hp 2-stroke engine) and the 110th (with a 110-hp 4-stroke). On the MSX models, the modern exhaust system PLANET is installed, which makes it possible to reduce the noise of a running engine by almost 60%. Jet skis are equipped with rear-view mirrors, a special footboard for boarding out of the water and a patented handle that children can hold onto while bathing. Thanks to its powerful motors, all the MSX jet skis can successfully tow skiers and other lovers of water sports and water activities. The second curious member of the Polaris water-motor family is Genesis. He is the only one designed to ride the four of us. The power of its 1.2-liter injection engine is 135 hp. The injection system provides this engine, despite its push-pull, one of the cleanest emissions in its class. The PERC reversing system allows this watercraft to easily move backwards with a side inclination of the hull and easily maneuver in small closed water areas, such as, for example, a dock or interprime space. Of course, Genesis is equipped with a special stainless steel device for towing a skier - he is considered one of the best in this category. In the sports series, three models - Virage i, Virage and Freedom. All of them are quite similar in appearance, but differ in motors and, accordingly, capabilities. Virage i has a 800cc engine. It is 27% more powerful than the 700cc installed on Virage and Freedom. Jet skis of this series are relatively inexpensive, but well equipped. Cheaper than all the relatively simple Freedom. Octane is the last in this short review, but the first in terms of sports and stunt riding. 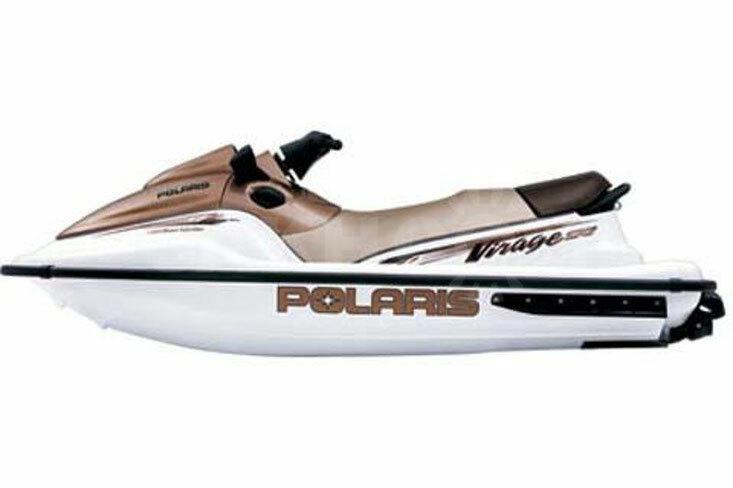 This standing jet ski is designed for those who can not imagine a life without adrenaline in their blood. 777-cc carburetor two-stroke engine accelerates it to maximum speed in less than 10 seconds. On Octane, you can dive into the water, overcome the waves, jump and ... in principle, for him there is nothing impossible within the physical reality. All jet skis, with the exception of Octane, are equipped with a new liquid crystal display (LCD), displaying up to 27 parameters of vital functions of the units and mechanisms. It is useful to know that Polaris offers its equipment and special clothing to its customers, which is produced by its Pure division.